At the end of January I began a currently-ongoing series of adventures with my friend Adam Ota. 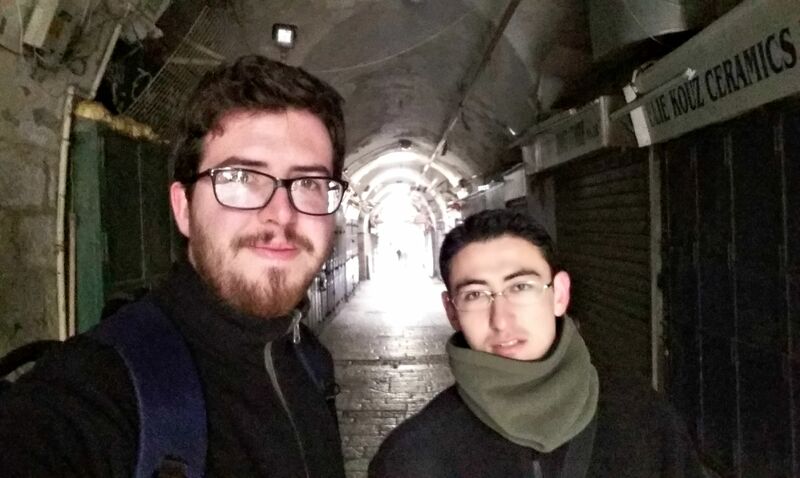 Being that we both like to explore, and that we are both on semester break, we decided to have some fun, starting with a Friday trip to Jerusalem. Having left early in the morning, we met up and boarded a bus under the rainbow-adorned skies of Bnei Brak. Disembarking in Jerusalem, we then boarded the light rail for the Old City of Jerusalem. Getting off near Damascus Gate, which we bypassed, we entered the walled Old City by way of the New Gate. I don’t recall ever using the New Gate so it was an experience in and of itself. Our goals were to simply explore, and we began right away. Keeping an eye out for interesting things, we passed the Latin Patriarchate and Santa’s House before making our way through the shuk (open market) of the Christian Quarter. Swinging north through the narrow stone alleys, we set out to find the site where the headquarters of the Crusader Hospitaller Order once stood. 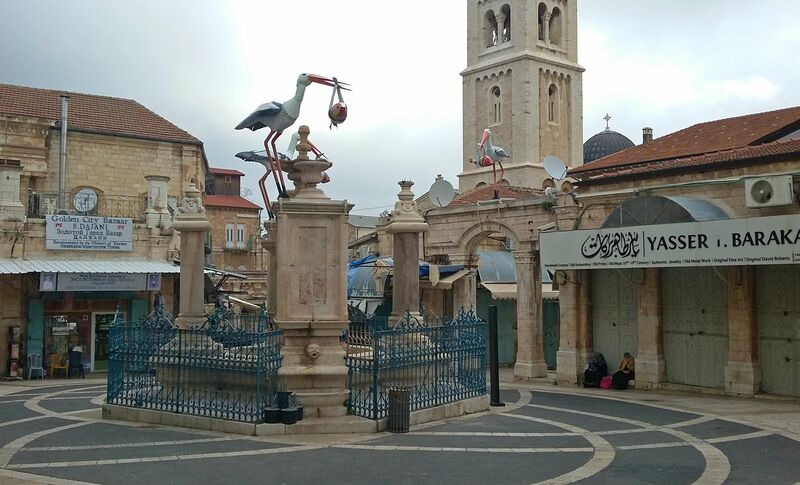 We passed a curious plaza of columns and arches, adorned with sculptures of white storks bearing fish instead of babies. Wandering around a bit, taking note of the various architectural intricacies, we found what we were looking for: a large white stone with an inscription about the medieval hospital that commanded the interior of a small fenced-off yard. 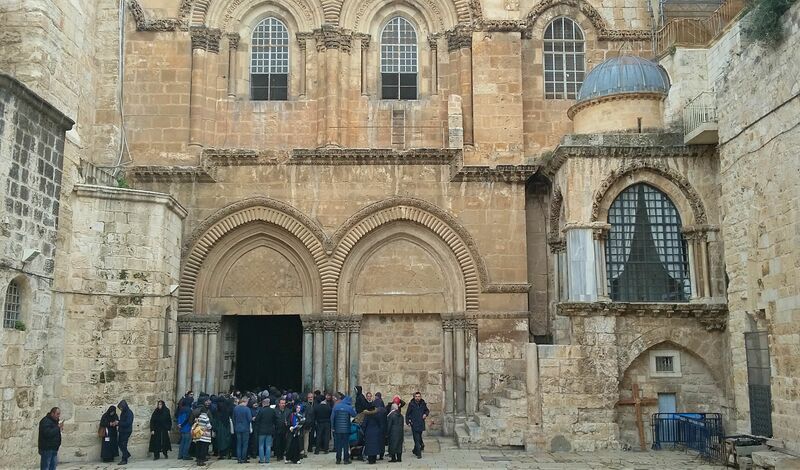 Continuing to explore, we stumbled upon the historical Aftimos Market and then the holiest Christian site in the world – the Church of the Holy Sepulchre. Curious as to what there is to see, we ventured through the arched gateway to the plaza and were wowed at the amount of pilgrims and tourists who were waiting to enter the site. Looking about, Adam pointed out a small ladder leaning against the window frame on the second level of the structure, telling me that there’s a story about it. He was right – this ladder is called the Immovable Ladder and has been there nearly consecutively since the 1700s. 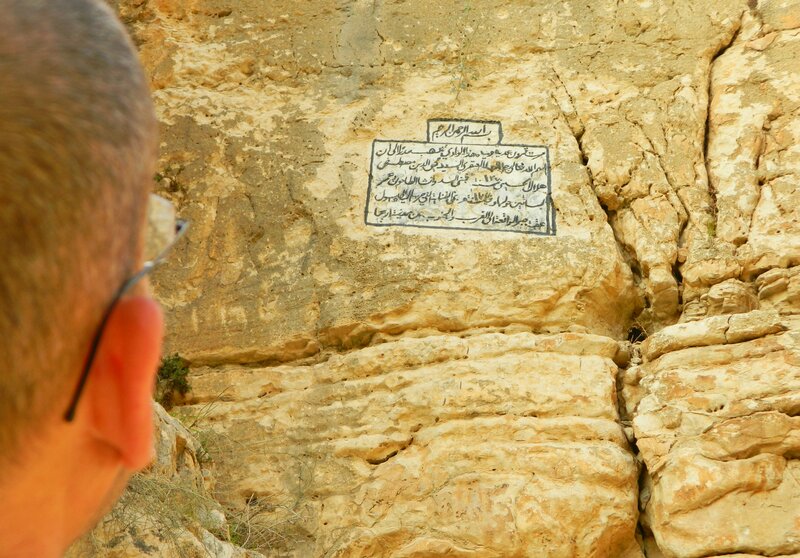 Since the ownership and rights are a complicated issue, every little change to the site or its possessions must be agreed upon by all five church orders who jointly share guardianship of the holy site. This issue has basically enacted a status quo situation for the ladder that was left there, albeit unintentionally, forbidding its removal. In additional, due to this same concept, archaeological work done to the site take ages to get approved, but the results usually prove to be interesting to say the least. Heading out with a Turkish group, we made our way back out of the Old City via the New Gate, once again. The next site on our itinerary was the Museum of the Underground Prisoners in the Russian Compound, not far from City Hall. We entered and began to explore the quiet museum, a building restored to resemble the prison that it once was. Built in 1864 by the Russian Empire, the structure served as a hostel for Russian pilgrims to the Holy Land. Later, the site was converted into the Central Prison by the British in 1918. Used the hold both Arab and Jewish prisoners, the prison was well-guarded. However, escapes were attempted, often with help from the outside. Eventually, the prison served as a warehouse after being cleared out during the War for Independence and was transferred to the Ministry of Defense in 1991. The building was restored to how we see it today, a remembrance for the difficult formative years of the modern Jewish country. 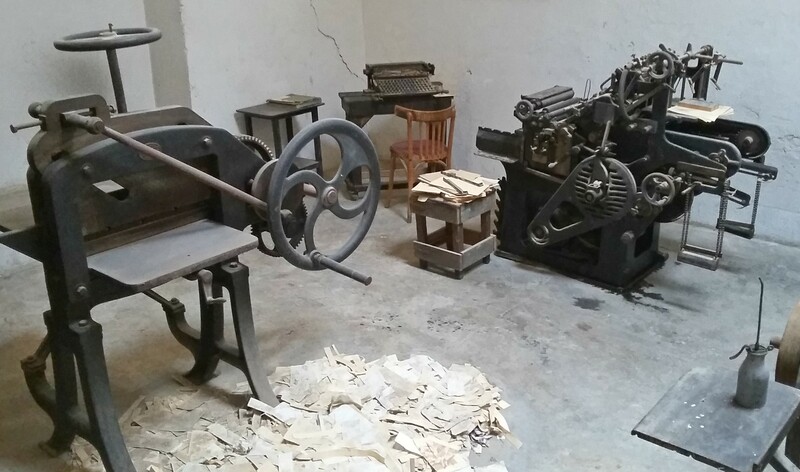 We began our tour of the building with the printing and wood workshops, working our way around in a counterclockwise manner from the central hallway. Next we viewed the showers and the kitchens, reflecting upon how life must have been for the prisoners here in the not-so distant past. Appropriate background noise played in the different workshop rooms which gave it a realistic ambiance. 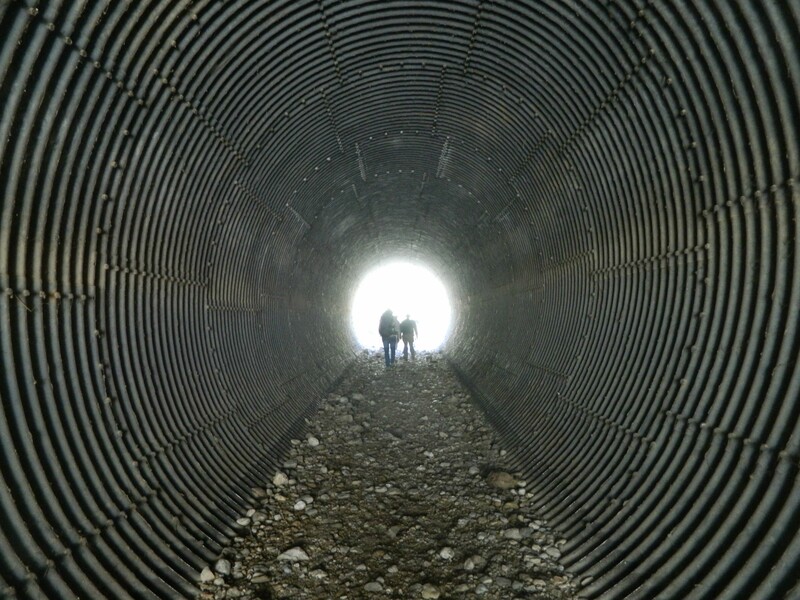 We moved on to Room 23, a group cell where an old escape tunnel still exists from the fateful day of February 20, 1948 when twelve members of both Lehi and Etzel groups attempted to escape via this tunnel. Another interesting feature of the room are floor stones carved with words, symbols, and illustrations by the prisoners as they idled away in their collective cell. From there we moved to the prayer room, making our way around the other courtyard. 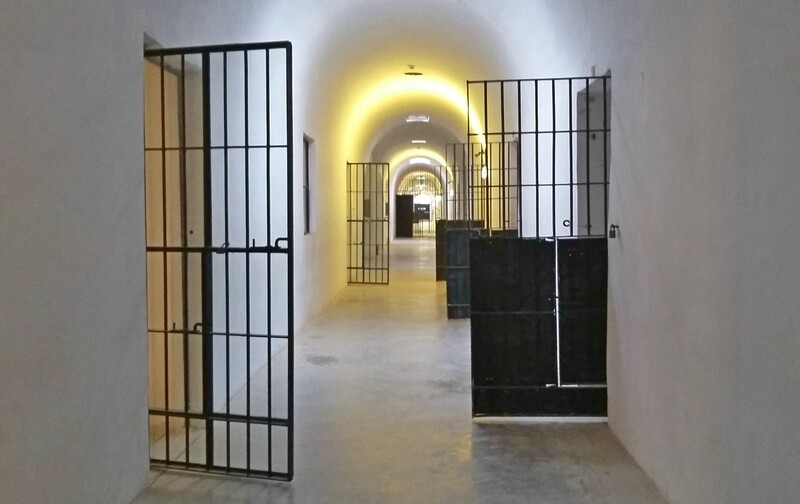 A visit to the solitary confinement cells and the local gallows, was certainly sobering and so we carried on. At the far end, just before the exit, we found the office of the prison warden which we found quite interesting. Beside the fireplace inside we noticed a vintage British fire extinguisher, an interesting antique. Outside, back in the cold winter air, we watched a pair of Syrian woodpeckers in a tree and then inspected the few outdoor exhibits before carrying on to the next site on our list. Up next was the Ticho House, just a few minutes away from the downtown area. 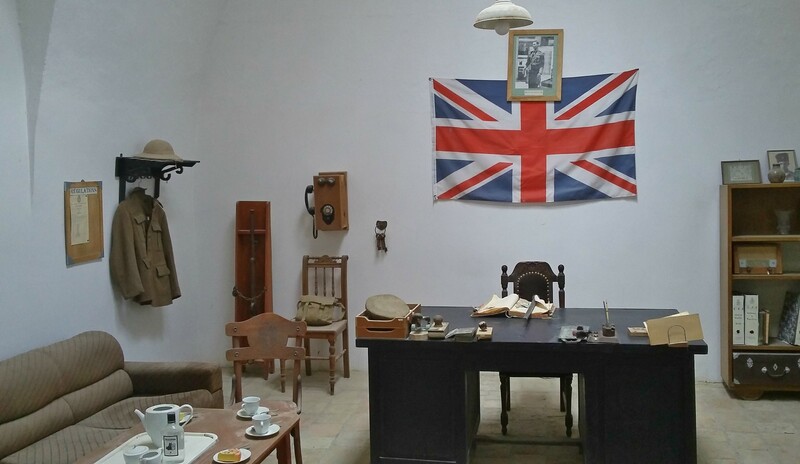 Operated by the Israel Museum, the Ticho House is the restored house of Albert and Anna Ticho, who lived there in the early and mid-1900s. It was one of the first houses to be built outside the Old City walls way back in 1864, and had transferred hands several times in the past 150 years. Today it serves as a small gallery with a balcony café, perfect for dates or adventure seekers. 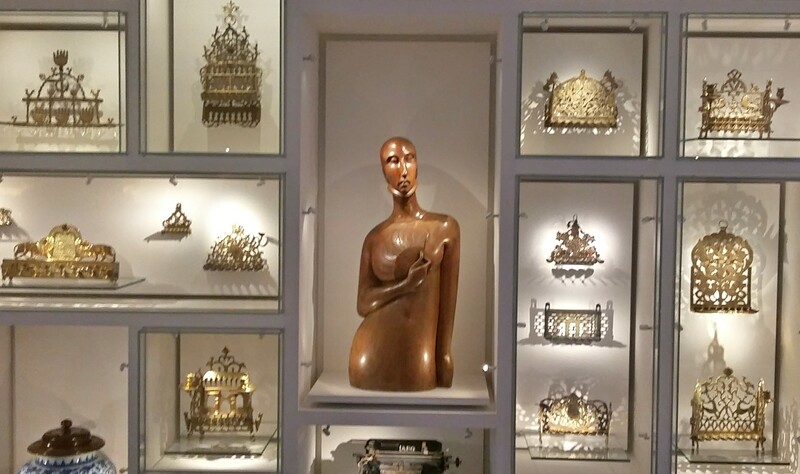 Inside, we began with the room on contemporary art but, as that isn’t quite our cup of tea, we moved on to the next room where some of Albert Ticho’s hanukiyyah (or, menorah) collection, that he had amassed over the period of forty years, was on display. Those and a few other interesting items on display rounded off that room and we ventured back outside. Wandering about a little to examine neighbouring houses of similar age, we eventually headed for the Machane Yehuda shuk (open market) where we were to grab lunch before heading back. Choosing the cheap route, we got falafel and then popped over to the local taproom, Hatch, where I sampled some of the new brew offerings, and settled on a cold glass of oatmeal stout. 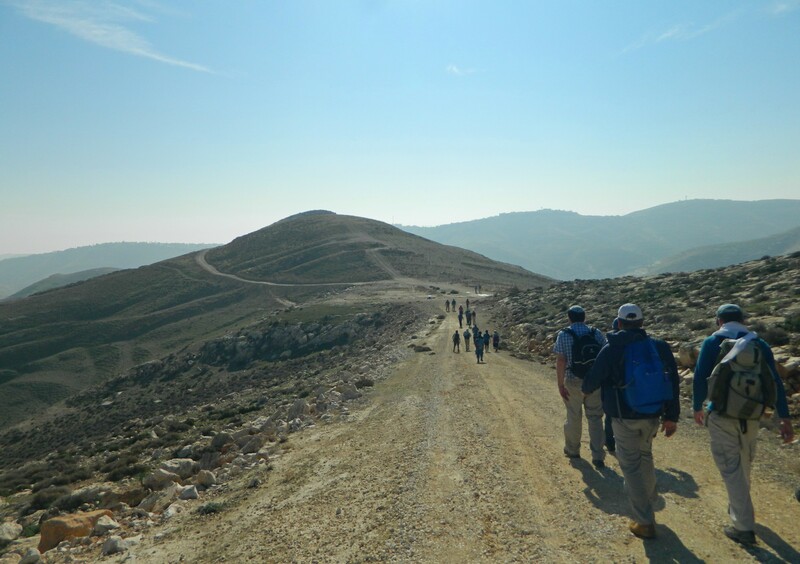 We then headed for the bus and arrived back in Givat Shmuel with enough time to get ready for Shabbat and the feeling that more adventures were on the horizon. 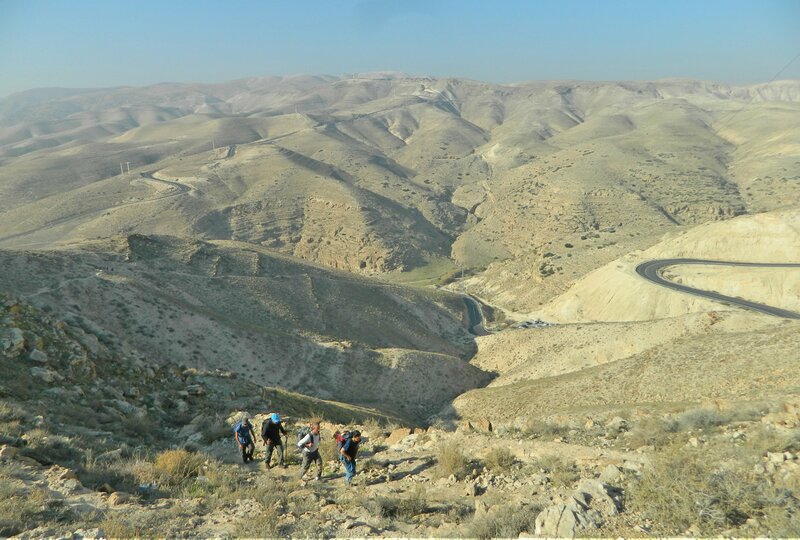 Continuing with our two-day hiking trip in the Wadi Qelt area with students and staff of Bar Ilan University’s Land of Israel Studies and Archaeology department, we awoke before dawn to begin another day. It was cold and dark but eventually we all stirred into action and were ready to embark on adventure. With our gear loaded we set out into the darkness. We followed a dirt road winding its way to the streambed far away as the sun slowly began to light up the sky. It was nearly sunrise when we reached our first stop, passing the most fascinating broken aqueduct bridge spanning two slopes. 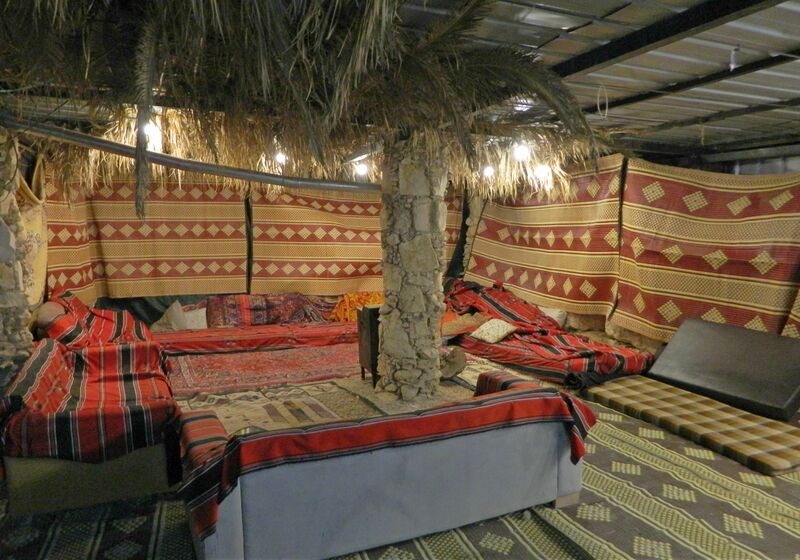 It was a series of stone structures built in the Ottoman period, surrounded by trees and noisy birds, now housing Bedouin families. We veered off to the side as not to disturb, and had a break to pray and eat a hearty breakfast (brought to us by Yehuda, the department’s patron). When our souls were lifted, and our stomachs filled, we returned to the hike for it was Friday and we had a good twelve or so kilometres to go in order to reach our final destination. We paused beside the fascinating aqueduct bridge, with its tunnels drilled into the rocky slopes, and learned that it was built in several stages: The concrete base built by the Romans and the upper stone section constructed in later years. 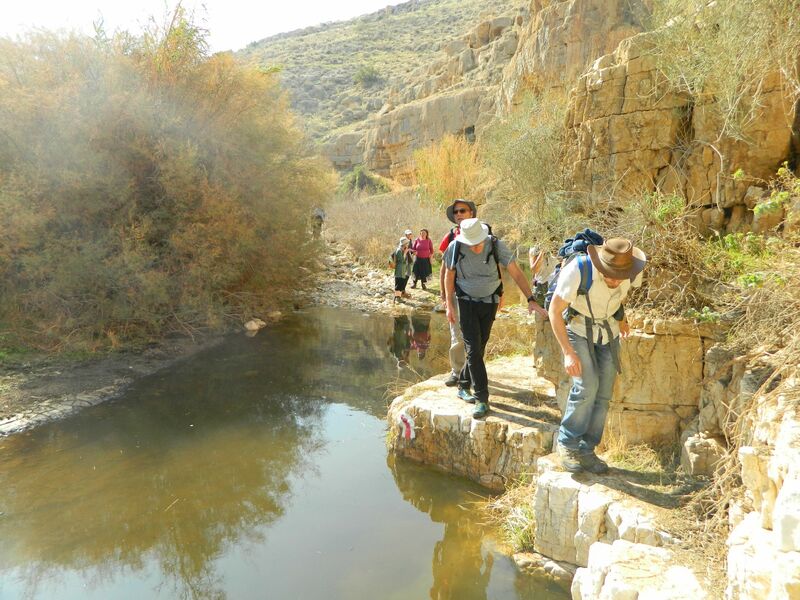 Reluctantly leaving the grandeur of the bridge, we started along the wadi path heading towards Ein Qelt, the spring which feeds Nachal Prat. We passed curious bunkers that were built by either the British or Jordanians to guard over the water source, as we made our way alongside the sluggish waters. 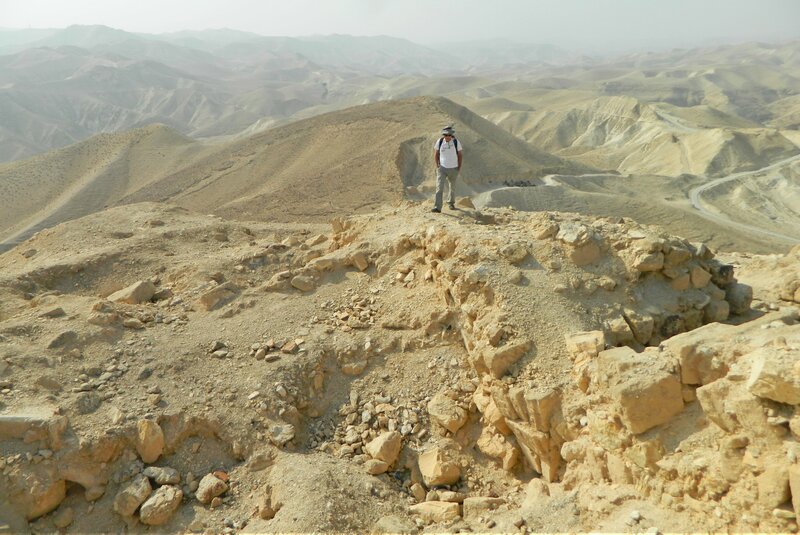 Before long, we reached Ein Qelt and spread out to explore. One interesting feature was this painted Arabic dedication which supposedly has to do with the Ottoman period buildings we had seen earlier. Enjoying the smooth rocks and the shallow waters, we stayed for a short lecture and then headed back out the way we came, this time walking along the northern banks of the stream. We found the trail to be following a curious yet simple floor-level aqueduct made of concrete, channeling the water eastward. 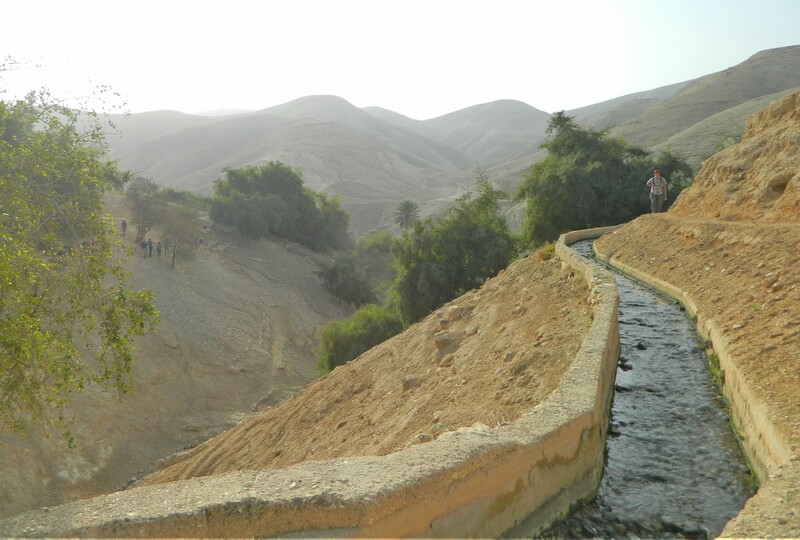 This waterworks was built by the Jordanians to supply water to Jericho, and as we walked, the extensive work that was put into the installation became apparent. We passed the buildings from earlier, the aqueduct continuing along peacefully as we walked and walked. Caves on the opposing mountainsides seized our attention but we remained faithful to the aqueduct, following its every whim as it dipped and turned here and there. We noticed as we walked how small bridges kept the aqueduct’s levels proper with the decline needed to transport the water. We continued on. Then we saw the first of many cross towers that dot the ridge of the wadi around the monastery, markers to pilgrims that they are on the right path. Suddenly, our aqueduct made a hard right turn and the slowly flowing water plunged down the mountainside to a bridge that was mostly broken, this more modern chute of water attached to the bulky ancient frame where an older aqueduct once stood. Continuing along on the other side of the wadi, at a much lower elevation, our faithful aqueduct brought us to the lookout over the monastery, marked by another of the aforementioned cross towers. 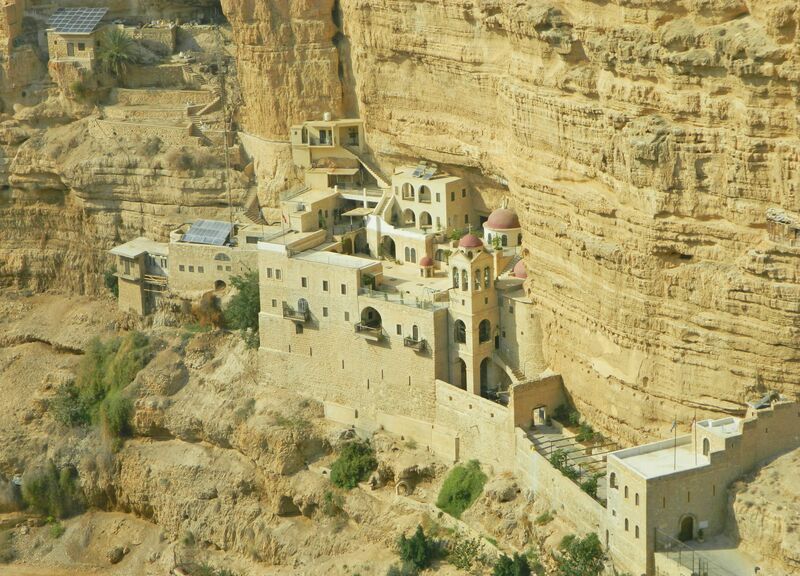 Below us was the iconic Monastery of St George, an old building complex built onto the cliffside. We sat down and listened to Dr Kobi Cohen-Hattab explain about the use of this wadi by terrorists in the 1960s. 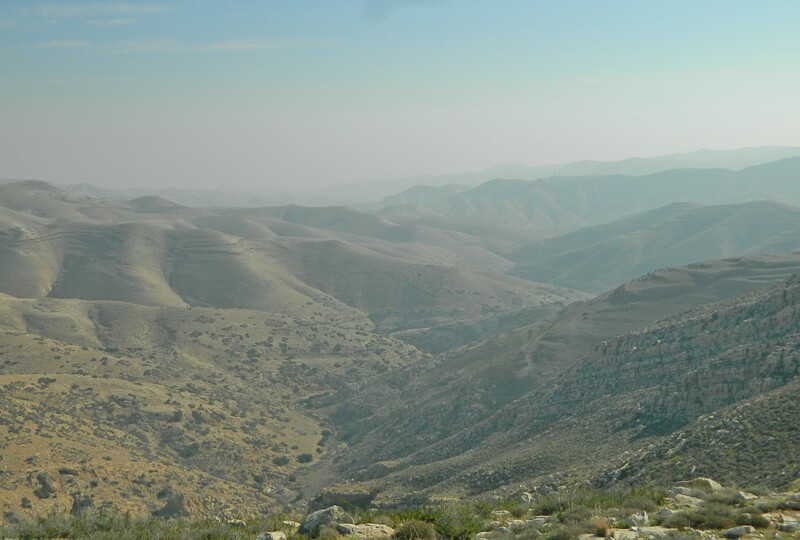 Sayeret Haruv (“Carob”), a dismantled special forces unit, suffered a single casualty, its commander, Lt Col Tzvika Ofer, in a battle with terrorists in the area below us. We descended the trail via rock steps which flattened out alongside the wadi, approaching the monastery which now loomed before us. 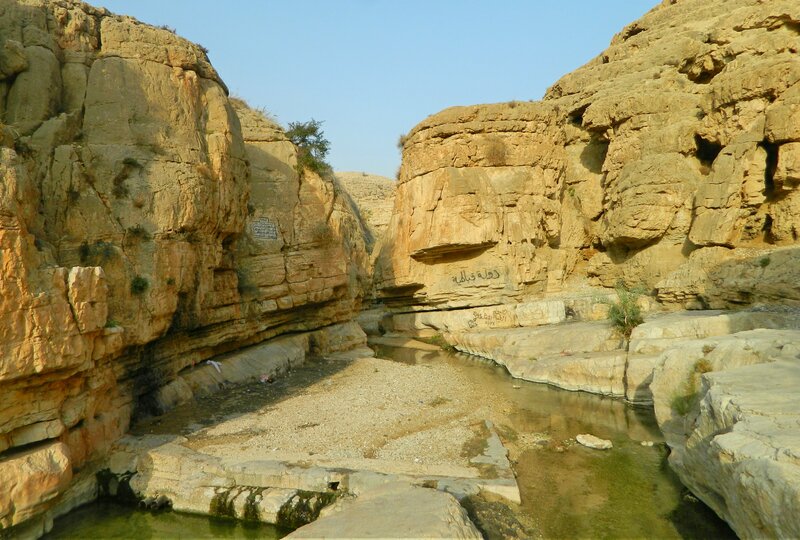 At the foot of the monastery, a small stone bridge spans the rocky gap of the streambed, providing easy access to the southern slope. We crossed this bridge and began the ascent up the slope on the winding road. Local Bedouins riding donkeys passed us every so often, asking if we’d like to pay for a donkey ride. At last we reached the top and passed through the site’s three-arched gate, adorned by a large cross and a dedication in Greek. Continuing along a trail, we reached the lookout over the monastery, seeing the structure at its most flattering angle. 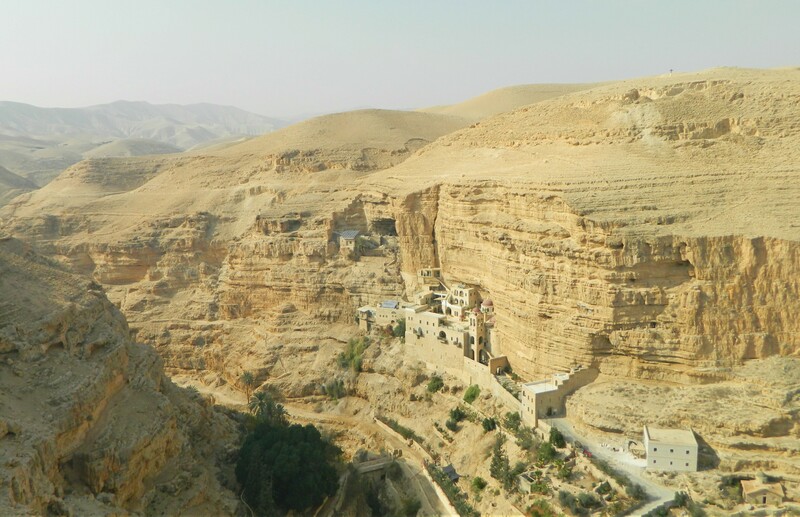 From this vantage point we were able to make out small windows and doors in the cliff wall above and around the monastery structure. These rooms house monks who live in isolation, going their brethren at the monastery only on Sundays. It was in a small cave like this that the monastery’s story began, harkening back to the Byzantine era in the 4th century when several monks created homes for themselves in small caves. Around the year 480 CE, a monk by the name of John of Thebes created a monastery for the monks in these caves to be a part of. It wasn’t until the end of the 6th century that George of Choziba came to join the ranks of monks at the monastery. 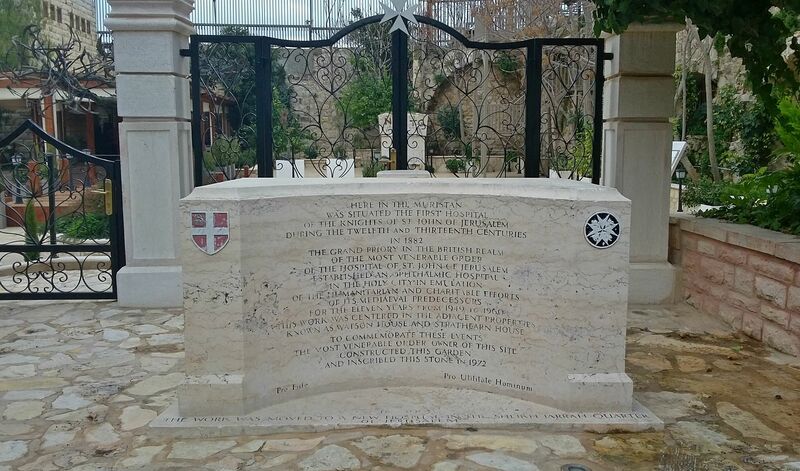 However, the Persian conquest of the Holy Land brought about death and destruction to the monks and the monastery, and only George was left alive, the monastery subsequently being called in his name. 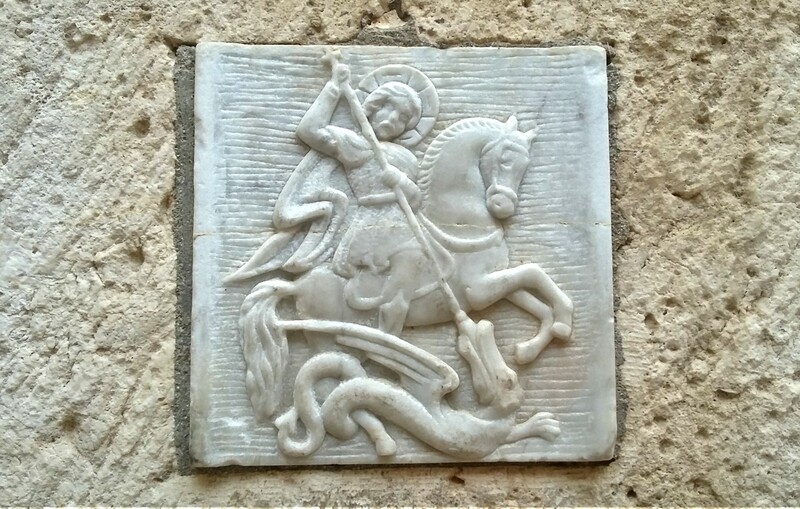 In the Crusader era the monastery was rebuilt, by the Byzantines no less, but was destroyed once again by the Muslims. It wasn’t until 1901 that new life breathed into the monastery, having been restored by a Greek monk for the Greek Orthodox Church. When we had seen enough of the monastery it was time to hike to the final destination of this two-day trip: the mountain fortress of Kypros. 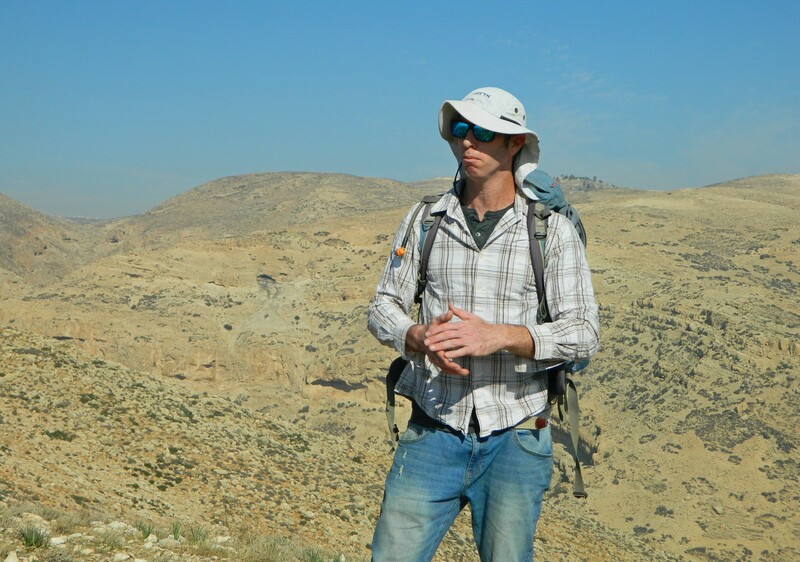 Built on a distinct peak overlooking Jericho, we were literally ending our trip on a high. We made this final push for the mountain; our legs weary of hiking for two days straight. 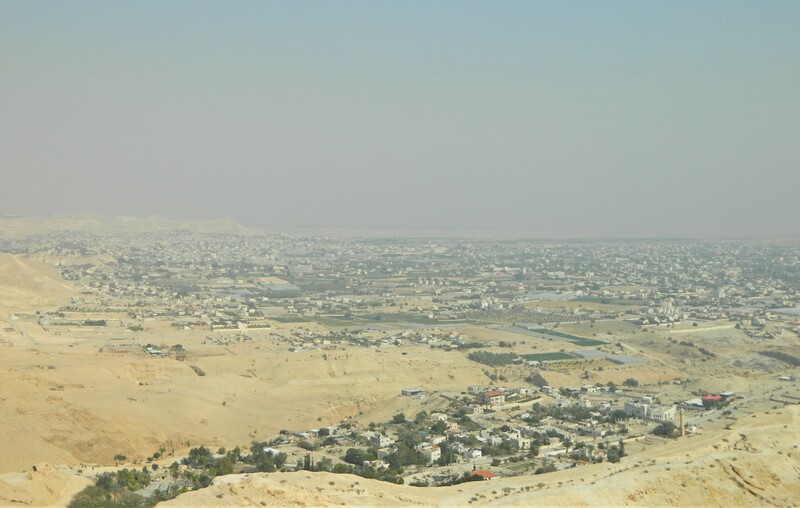 At last we reached the lower plateau of Kypros and the city of Jericho laid spread before us. Dr Dvir Raviv, the man leading our excursion, gave us a geographic overview and we were able to pinpoint sites of interest in the hazy city below us. Relatively close by, at the outskirts of Jericho, are the Hasmonean and Herodian palaces which have been excavated over the years. We had hopes to visit them but hadn’t received permission from the military, which left us with seeing them from afar. These palaces were largely built by the Hasmoneans, who had liberated the Holy Land from the Greeks. 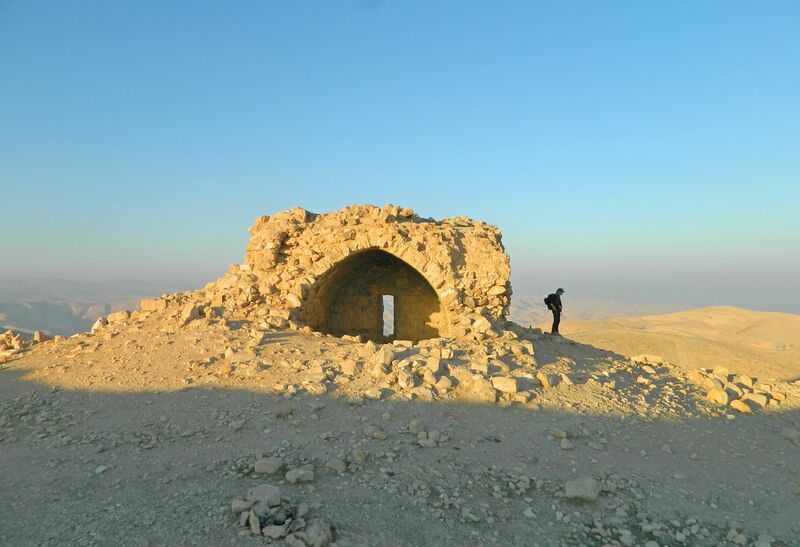 Constructed in the arid desert regions, these winter palaces were far more comfortable to live in during the cold winter months than the main palaces in cold, and sometimes snowy, Jerusalem. Herod used this same concept, and incorporated these palaces into his estate as well as building new ones. Unfortunately they were all razed during the Roman period, and due to the current political situation, the ruins are hard to access. 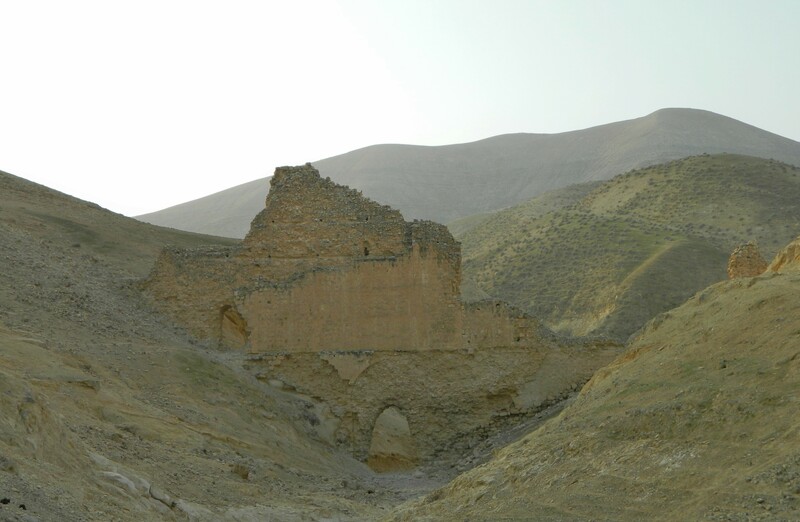 Returning to Kypros, this mountain fortress was built by the Hasmoneans and then refortified by Herod several hundred years later to control the Jericho region. Being rather short-lived, the fortress was destroyed by the Romans during the Great Revolt and hasn’t been rebuilt since. We climbed up to the highest part of the mountain and examined the excavated ruins of the fortress whilst enjoying the view. It was a grand feeling to finally be done with these two exciting days of exploration, especially because I had never been to any of these sites before. To end off the trip, we heard from Prof Lilach Rosenberg-Friedman, our new department head, who is initiating all sorts of exciting new plans for the department. Hiking back down the mountain, we found our tour bus waiting for us at the arched gate of the monastery and began the drive back to Bar Ilan University. Ready to get back, have Shabbat and sleep, we couldn’t agree more that there needs to be more trips of this nature in our department. Blending academia with the great outdoors in a most excellent way of living life to its fullest, and we sure like to live. A video of this trip, which I made for the department’s YouTube channel, can be found HERE. The week after our exclusive tour of the IAA warehouse and the Rockefeller Museum in Jerusalem we embarked on another exciting trip. 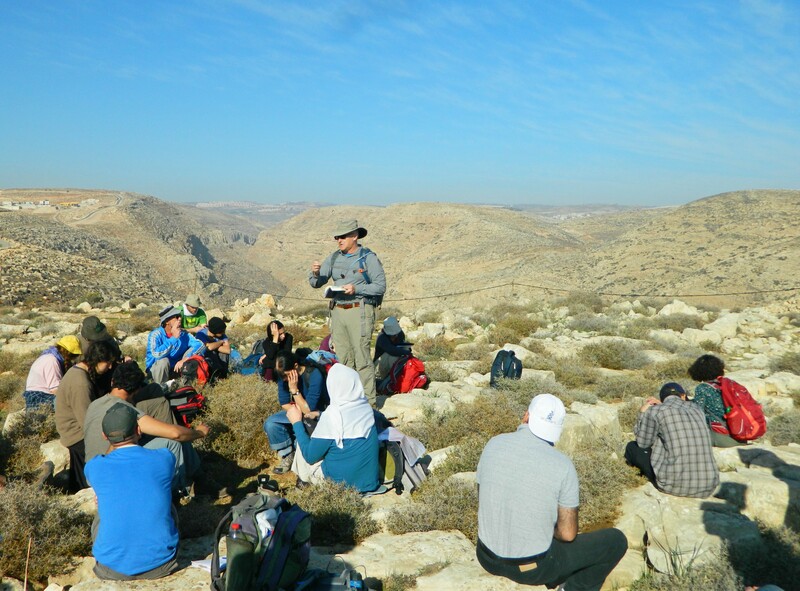 Again with the Land of Israel Studies and Archaeology department of Bar Ilan University, this adventure was a two-day hike in the Judean Desert, predominantly in the area of Wadi Qelt. 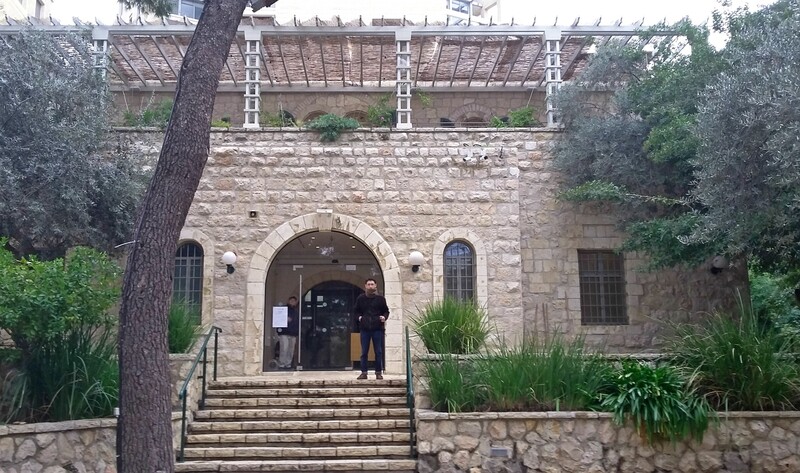 The fun began at the BIU campus where we loaded up the bus with ourselves and our belongings, setting out and meeting up with the rest of the participants just outside a small yishuv by the name of Adam. 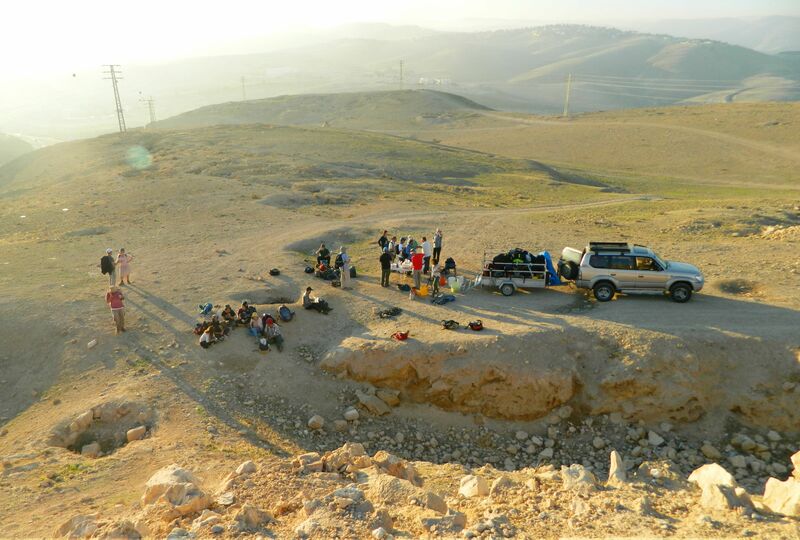 There we had hot beverages and cookies brought by the department’s patron Yehuda (who joined us on the Tel Goded survey), who would follow us for the duration of the trip providing food and logistical support whenever needed. We received the first of many briefings at this starting point, mostly given to us by the fearless leader of the trip, Dr Dvir Raviv. 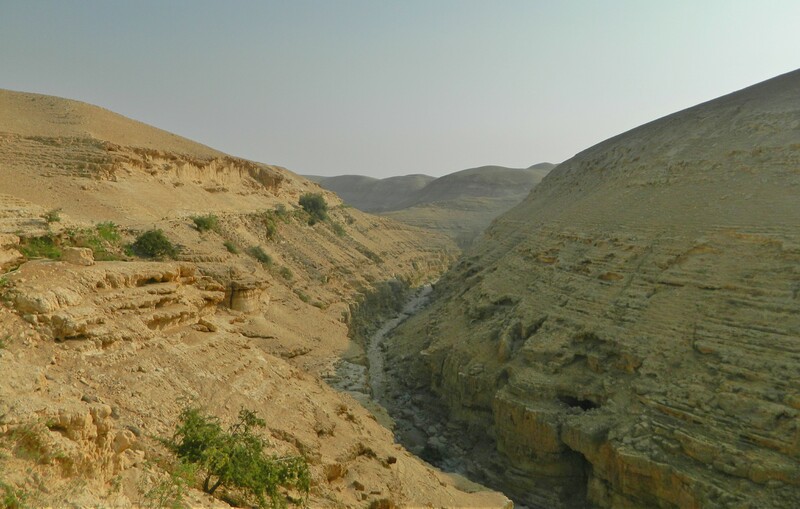 Our plan was to hike down to the streambed of Wadi Michmas below us and then continue ever eastward until reaching Mitzpe Yericho, with several stops along the way. With the fantastic mountainous desert view, and the beautiful blue skies striped with wispy cirriform clouds, we were ready to hike. A quick sighting of some active greenfinches started off the fauna aspect of the trip, and I was eager to see more. Already atop a ridge of hills, we followed a simple dirt road until we reached a tiny vineyard where we merged over to a tiny unmarked trail alongside the slopes. 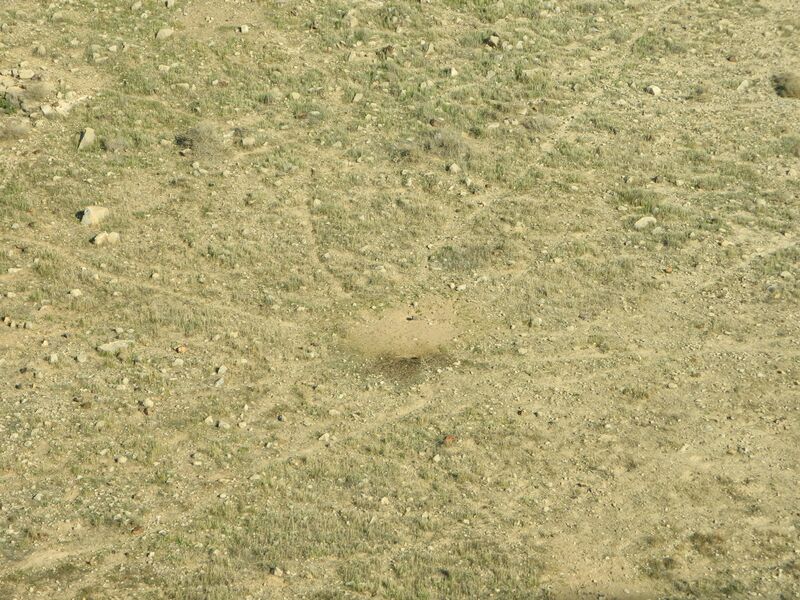 Several gazelles were spotted, as well as some pariah dogs in the algae-choked stream far below. 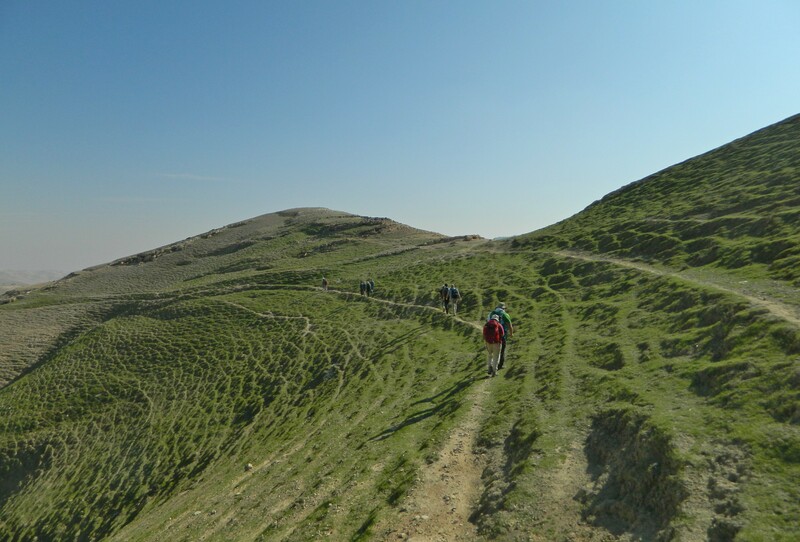 We marveled at this unusual trail, even if it was awkward to walk on at times, and at last found ourselves descending to the rocky wadi, spotting several sand partridges making their way up the opposing slope. 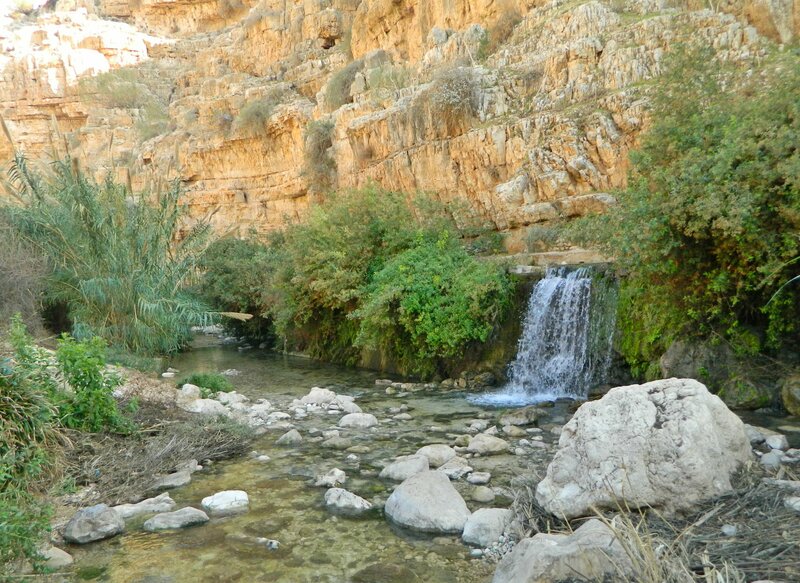 On level ground, we crossed the small stream and began walking the picturesque trail towards Ein Maboa. As we walked, I was greeted by a nice sight: my first long-legged buzzard. I got one good picture before it soared out of sight over the top of the cliff alongside us. A few blackstarts later and we were crossing the stream once again at the site of the old Roman aqueduct. From there it was a short walk to the local road and over to an even more picturesque stream-side trail, this one taking us to Ein Maboa. The crossings back and forth over the calm stream made for an interesting hike — a few unfortunate party members slipped into the cold water. At last we reached Ein Maboa, a national park with a gift shop and restrooms, where we broke bread for lunch. A nice concrete structure holding the spring water provided entertainment for those wishing to swim, and the rest of us watched amused. Just beside the pool is the mosaic floor of a Byzantine church which was discovered in 2008. 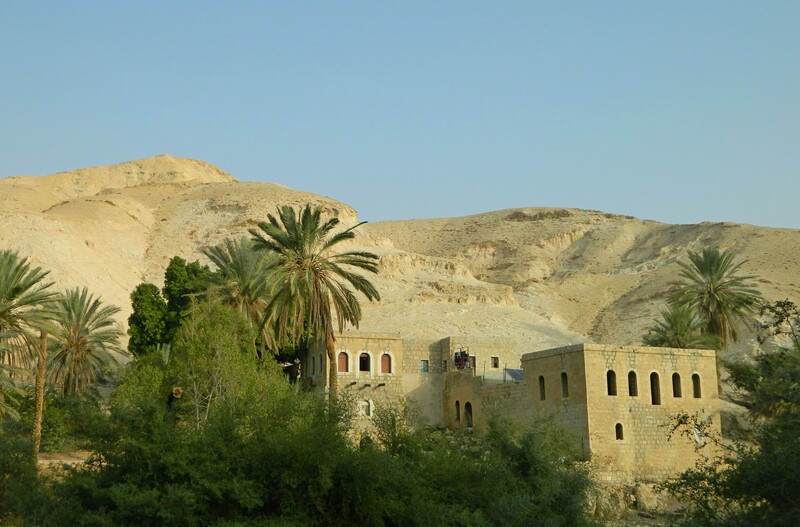 This church was part of a monastery, of which we’d learn more about the next day when encountering the famous St George Monastery at Wadi Qelt. After finishing our lunches and learning more about the local monastery, we hiked out of Ein Maboa and climbed the mountainside directly south. It was an arduous hike; the steep incline of the hill seemed to go on forever and ever. Looking around we gained appreciation for the tough hiking streak we were on, the views always rewarding. At the top, alongside yet another road, we were enchanted by the sounds of a flute and a harmonica, while we gazed out at the view and watched foxes play far down below. The hike was nowhere near done, and before we knew it we were back on a trail, plunging into some rocky area in the direction of Road 1. Our next stop was overlooking the road, and in true trailblazing fashion, we took the most direct route we could find. We passed a large amount of gnawed cow bones, a great grey shrike and an interesting geological formation of rusty-looking stone blocks. Taking a quick breather at a dung midden belonging to mountain gazelles, we learned about the manners of communication and territory marking that some species employ. 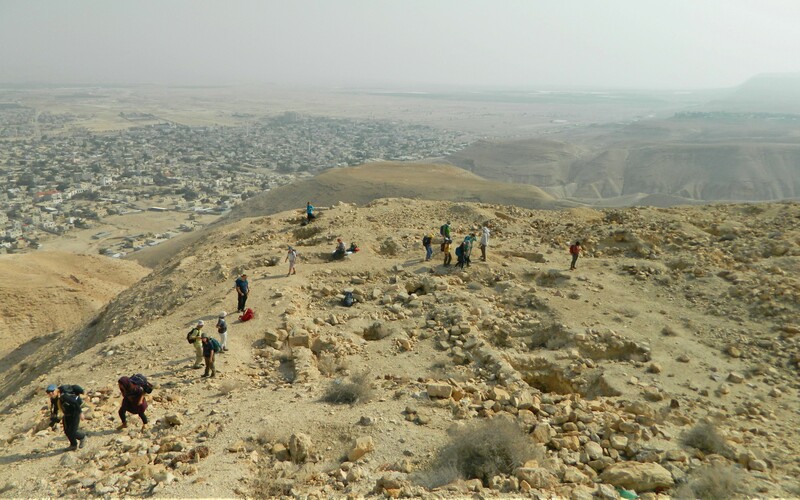 Getting back on our feet, we then hiked up another steep hill to our next stop, the location of historical Ma’ale Adumim. Overlooking Road 1 and neighbouring the Inn of the Good Samaritan, we found the remains of archaeological excavations at the top of the hill. 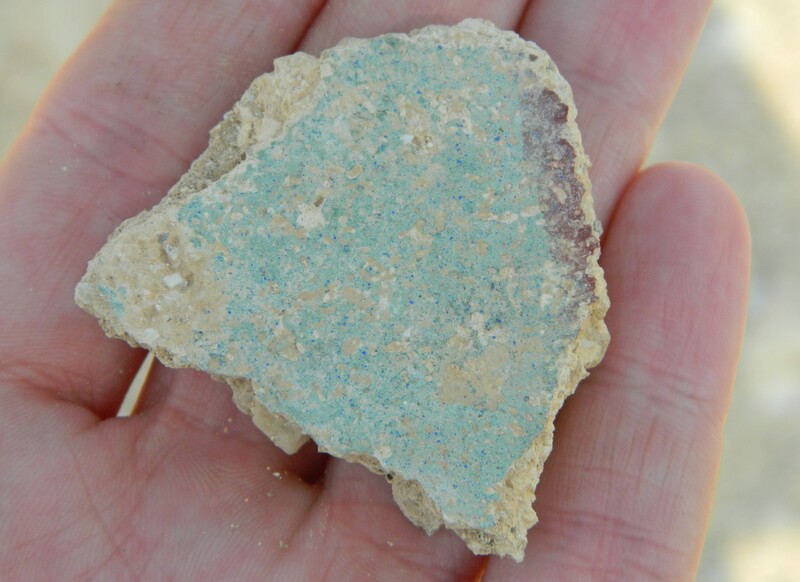 An unknown Herodian palace was discovered in 2003, the structure suffering structural damage after the building stones were taken for later projects nearby. 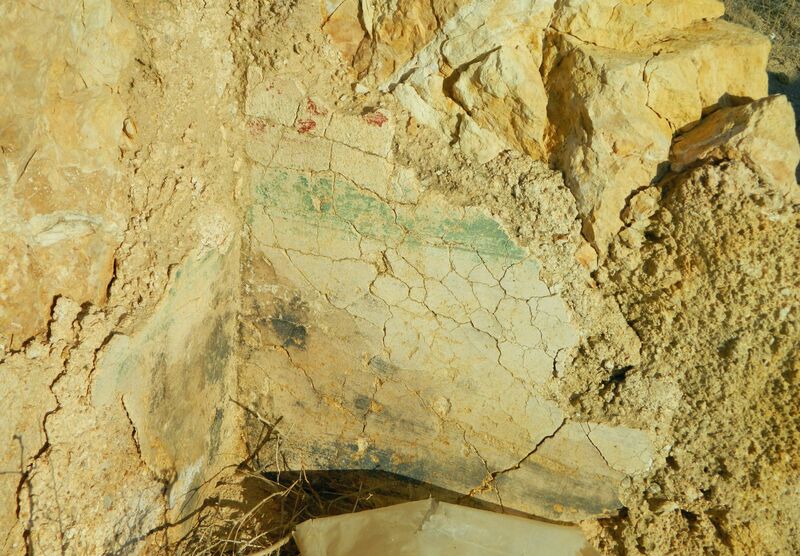 Remains of a stucco wall of the Roman villa, with its paint in green and red, left in situ to be enjoyed by the good folk who come to visit the obscure site. 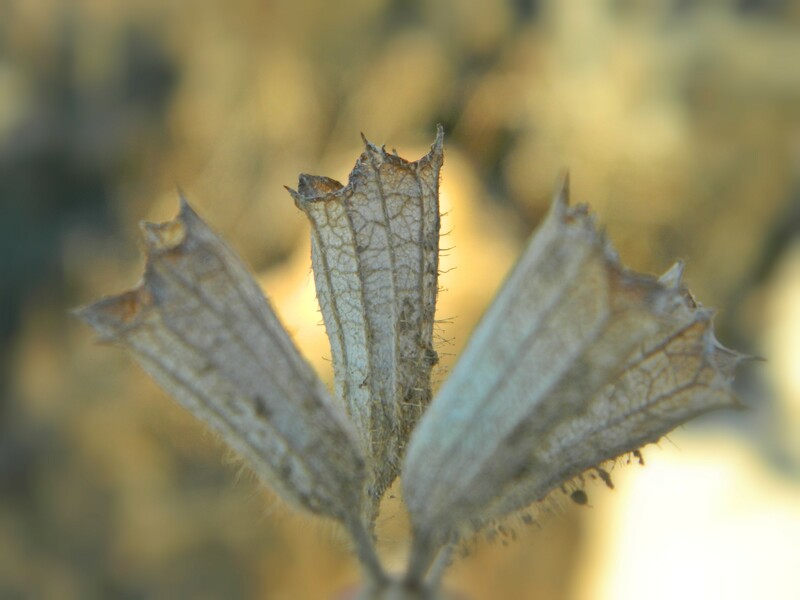 Another curious thing to catch my attention were some dried flowers of the toxic desert henbane found growing beside the Roman villa. Hearing that it also has hallucinogenic properties, I made sure to carry the flowers with me, just in case the lodgings that night proved unbearable. I jest, of course. After learning more about the site and the excavations that had taken place, we made our way to the neighbouring hilltop, crowned by the ruins of Castellum Rouge. 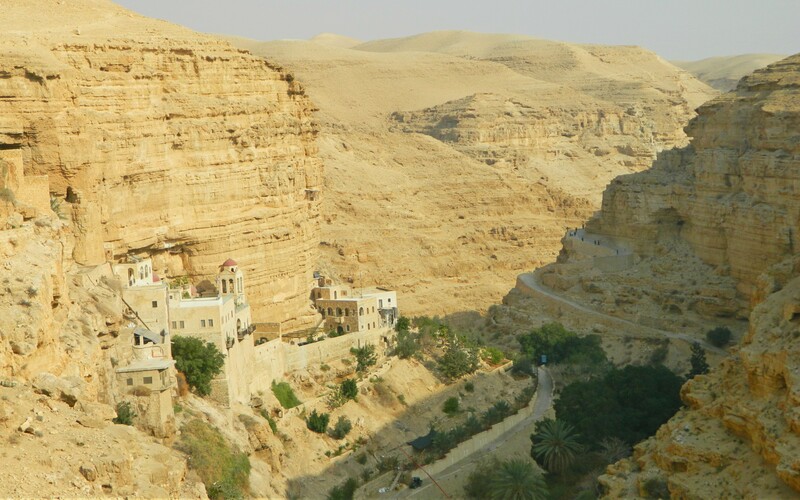 A Crusader fortress built sometime around the year 1172 to protect Christian pilgrims travelling between Jerusalem and Jericho, it also served to safeguard the Inn of the Good Samaritan. Today not much remains of the fortress, but I was elated at the chance to tick yet another Crusader castle off my “to-visit” list. On our way we passed a lovely sight overlooking the mountainous desert view: a small table set up all fancy-like with wine, flowers and chocolates and a happy young couple who had just gotten engaged and were phoning their friends and family. Interestingly enough, I came across a “point of interest” marked on the AmudAnan map attesting to this moment in their lives. Not wanting to crash their special moment, we skirted around them and made our way to Yehuda who was waiting for us with more refreshments, but we certainly wish them a heart “mazal tov”. The sun was on its way westward and we had yet a long way to go, so we explored the ruined fortress rather speedily and then hit the trail again. 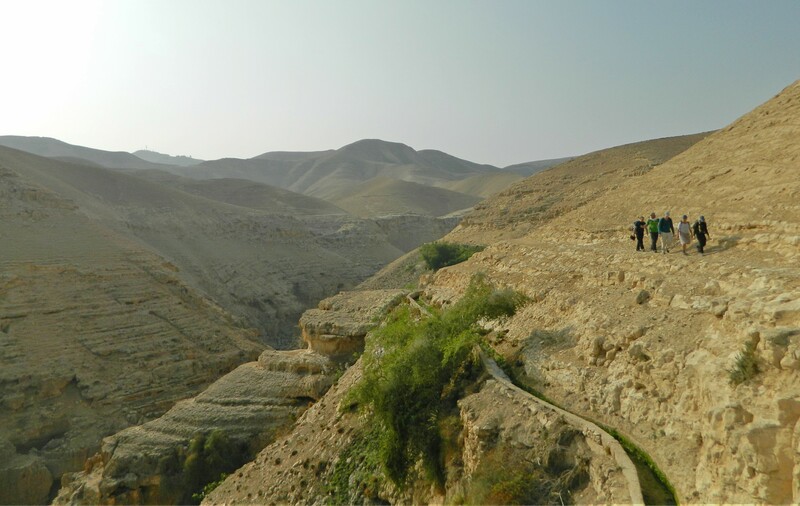 This trail followed the old British road and we made good time walking to Mitzpe Yericho, where we were to spend the night. 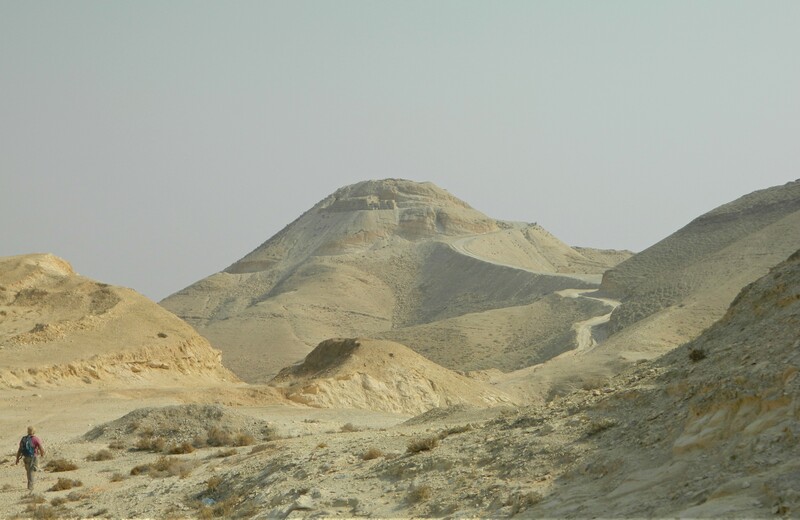 Along the way we had a little discussion about marinite oil shale which, found in the Judean desert region, is a possible fuel source that may or may not be worth mining. Nightfall came before we reached our destination and some quick navigation was made as we closed in on our lodgings.